HI! Well I had three birds, 2 males and 1 female. The first old male has died :( , so I thought why not try the younger bird! I put him with the female that I think is older than him and every time the male tries to sing to her she beats him up!! I don't know why !! AND !! before the old male died he had some relations with the female but sadly the baby birds die :( and i don't know why. Please help me. And sorry for the bad english ! I think it is a common issue and if you feel like that then don’t allow them to live in a single cage. Separate them immediately. Otherwise it will happen like this. So watch them carefully. Keep sharing! This behavior is quite common in canaries, although you should ask your veterinarian for more information and a possible solution. I also have four canaries in my home and I have been keeping then in a wonderful cage. Now they are much healthy and don’t have any other issues. I am very happy to visit this blog daily. It encourages me a lot. Join in and write your own page! It's easy to do. How? 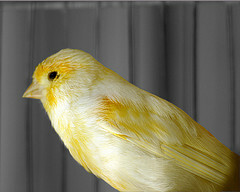 Simply click here to return to all about breeding canaries.